The Lactina Select vs. Symphony Plus Smackdown! Unlike many of our competitors, we offer different options for Hospital Grade Rental pumps. While having a choice has its benefits, it also comes with the burden of needing to DECIDE. Factor in the sleep deprivation that accompanies becoming a new parent and decision-making abilities can take a nose dive. We receive a lot of calls from sleep-deprived parents that are confused about the relative merits of the various rental options available to them through Lactation Care. We love guiding folks by phone through their options, but our IBCLCs have limited office hours, so for the benefit of the bleary-eyed-up-at-3am-and-wondering types we offer up the Lactina Select vs. Symphony Plus Smackdown! 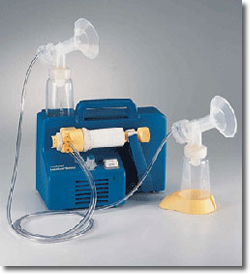 Both the Lactina and Symphony are fantastic multiple-user pumps. 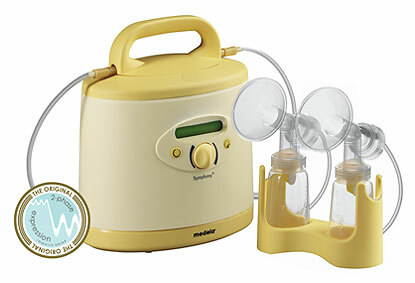 If you’ve been up late before, perhaps you’ve read a bit on our Breastpump 411 about the merits of these tools that are suitable for establishing and maintaining a milk supply, even in the case of complete mother-baby separation. Both the Lactina and Symphony are designed to do the same things: establish and maintain a woman’s milk supply. They do this in slightly different ways and hence…the smackdown! Lean and mean, this one is lighter and easier to carry around than a Symphony Plus. They both have about the same foot print, but the welterweight Lactina, at half the weight of the Symphony, is much easier on the arms and wrists. Bells and Whistles: Few to speak of in this minimalist design. Built in backup hand pump is part of the pumping kit. Requires two prong wall outlet or car adapter for power. No battery option. Pricing: Flexible terms make pricing quite favorable for a long term rental. On a 5 month rental the daily rate is just a little over a dollar. Piston and Cylinder assembly unit, included with the Personal Accessory Kit, doubles as a compact manual pump for pumping in a pinch during travel or power outages. Lightweight and portable, the motor actually weighs less than most full-term newborns. $$ is very favorable on long-term rentals, way cheaper than your burgeoning latte or Redbull habit. Not exactly silent, but the noise from this pump is still significantly less than with a PIS or Freestyle. The Deal: Overall, the Lactina Select is a great rental pump for experienced or long-term pumpers looking for economical pricing options. It doesn’t have all the bells and whistles, but it’s a workhouse whose technology has been serving our pumping mothers well for over 25 years. Weights and Measures: Pump Motor: 8.5 lbs. This one falls in the Heavy Weight Division. Those two Lithium batteries alone weigh about a pound and a half. Mohammed Ali could have used a couple of these babies for a kettle bell work out. Sounds Like: Quiet as a church mouse. Seriously, this pump is so quiet that many times families think it’s not working because it is so hard to hear the motor, even at full blast. Speed: 2 Speeds that the user can toggle back and forth between, AKA 2-Phase Expression® Technology. This feature allows users to shorten pumping times by hastening a faster milk ejection reflexing by mimicking the suckling pattern of an infant. Pressure: Variable adjustable via control knob. LED display on front face of pump displays relative pressure intensity. Range: 110-240 mm Hg. Bells and Whistles: We don’t call it the Rolls Royce for nothing! Two internal rechargeable lithium ion batteries provide backup power on the side for those “in a pinch” moments. This pump automatically resets the pressure to the lowest setting at the beginning of each new pumping cycle, so you don’t have to. 2-Phase Expression® can shave a couple minutes off your pumping time. Standard pump at many major hospitals means that many moms may already have a kit and not need to purchase a complete kit outright. This pump is pretty heavy. Not the easiest thing to lug around. The rigid carrying case is…how shall we say?…Well, let’s just say it’s a bit of a ballistic bowling bag and at press time no matching shoes are available to complete the ensemble. Kinda pricey compared to the Lactina. No built in hand pump comes included with the standard kit. You better have a Plan B lined up ahead of time or be well versed in the art of hand-expression. Ootherwise you may be in trouble during an extended layover or power outage. The Deal: The Symphony Plus is the latest and greatest in multiple-user pumping technology. It’s got a few gremlins due to the heavy electronics but you’d be hard pressed to find a quieter, more efficient pump. It’s our recommendation for new moms struggling during the first few weeks postpartum, those moms looking to boost their supply, or busy moms needing flexibility and quiet pumping for the office or business travel. Which multiple-user pump did you use? How long did you pump for and why? How did it go for you? Would you use the same pump again? Did you make use of our phone support service? Share your stories with the Lactation Care Community. Cast your vote and receive a coupon for ½ off the retail price of our in-stock nursing bras. Is your baby sleeping through the night yet?? ?